As a class music teacher in the 1970s and 1980s, my aim was to get all children playing instruments as well as singing – so for me, the TV Coke advert became “I’d like to teach the world to play”. In teaching whole-class keyboards, guitar and tin whistle with children aged 7 to 14, this ambition was pretty well realised, and the 15 guitars that I bought from Moore and Stanworth’s in Leicester in 1978 are still in use at Winstanley High School, hanging from the pegs where I first placed them 35 years ago (photo evidence can be provided!). On the Royal Festival Hall stage, the children in the Montagu School Ocarina Group listened eagerly to the adjudicators as they prefaced their comments with “we don’t know how difficult it is to play an ocarina, so it hasn’t been easy to assess this performance”. This is an ongoing issue with Ocarinas. 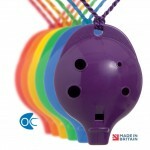 Are Ocarinas too simple? 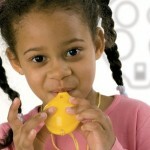 Do children learn music ‘properly’ with these four-hole wind instruments? Is reading from tablature as acceptable as reading from staff notation? People get hung up on the instrument and its teaching methods, overlooking the quality of music performed – the very thing that should mark a child’s musical progress.